My bike ride yesterday made me realise how fortunate we are to live within cycling or running distance of some great sights in the centre of a wonderful city and that I must break out of my usual routes and run more of London’s streets. I had to run 10-12 miles today so I followed a similar route to which we cycled. 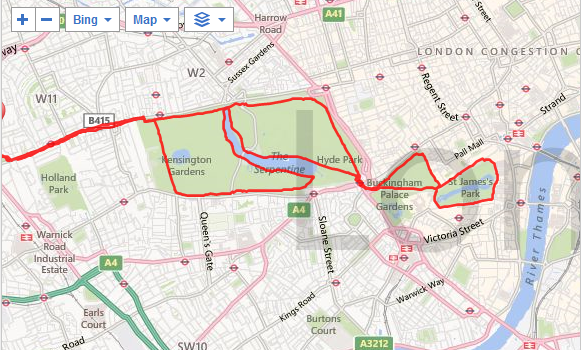 My route took me around 4 Royal Parks, from Kensington Gardens, Hyde Park, Green Park and St James’ Park. I went through Wellington Arch, down Constitution Hill, ran down the Mall, around past Horse Guards Parade and looped back to Buckingham Palace. I was going to take some tourist snaps for this blog but realised when I got there I hadn’t brought my phone or camera (I have a new iPhone which I don’t want to ruin getting it damp in my pocket!) so you’ll have to put up with my garmin map instead. The first 3 miles were hard going (as usual) until the aches and niggles worked their way out and I settled into a good run. As I ran down towards Buckingham palace and along the Mall it felt fantastic to be running a fresh route. I was at the finish of the Marathon and where the Bupa London 10,000 is run; it was a mild sunny morning and I could almost feel and smell the start of a spring race. I really felt the buzz, keen to get to the marathon and motivated to run and run! I should have run an extra loop of the Mall to make up the miles instead of my loop of the all too familiar Serpentine on the way back which felt a little less enthusiastic. But all in all a very good run which I finished on a high with a grin! Janathon day 12. 11.46 miles run. Categories: Janathon, running | Tags: Janathon, London, marathon training, Running | Permalink. Oh I have only visited London twice when I was younger. I went through Hyde Park, it was massive, and just nice! I wish we had something like that up North! Wow, what a fabulous route. It’s reminded me about the Royal Parks half, it’s on my running bucket list. Well done, super Janathon run. Royal Parks Half is a great race! I visited London a few years ago and was amazed by Hyde Park and the running/riding options it offered. How do your legs cope with a ride one day and a run the next? I have never been much of a runner for the sole reason that it made it hard to ride/run depending on which was done first. So far my legs are coping with rides then runs. I was a bit achy for the first week when I first got back into cycling but ok since. But then I’m very much a leisure cyclist and not ultra fast. I find the cycling is great cross training, gives my legs a break while exercising. What a fab run and yes, you are lucky to live in the best (in my opinion) city in the world. How beautiful! Great mileage Rachel – you are so lucky you get to run there everyday – more pics please!